When first looking at Creative Labs new ZiiSound T6 wireless speaker system, it is not difficult to see how similar it looks to their GigaWorks T3 speaker system. It seems as though the GigaWorks T3 was the design on which the newer ZiiSound T6 was based. However, the ZiiSound T6 does feature several notable differences. 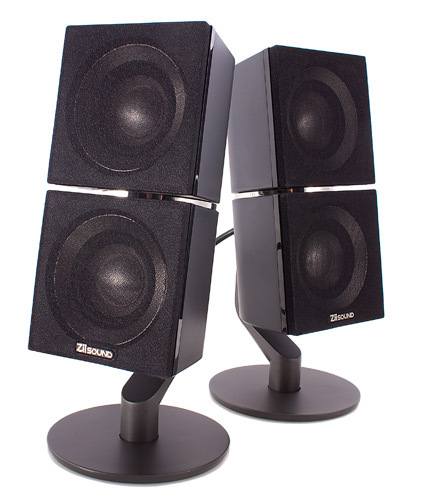 First is that, unlike the GigaWorks T3, the ZiiSound T6 features four satellite speakers – two on each speaker pylon. 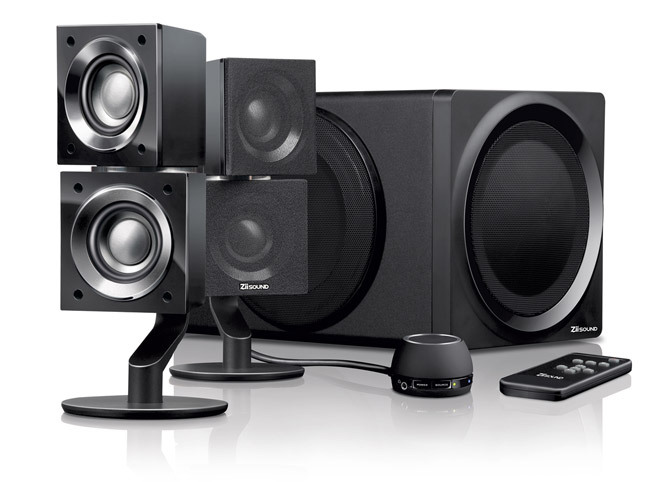 These satellite speakers can be rotated for increased virtual surround sound. 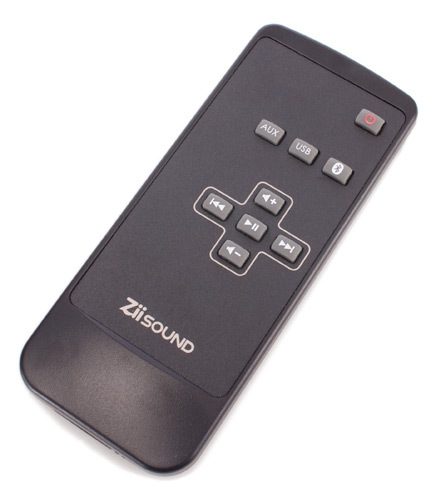 The ZiiSound T6 also comes with an IR remote to control the volume, audio source, and off/on switch. Setting up the ZiiSound T6 in wired or wireless modes is simple. Just plug in the sub-woofer and control pod to your PC and off you go. You can hook up the speaker system as a fully-wired system – in which case you will be privy to some better sound quality. Unfortunately, the Bluetooth signal used in the wireless transmission features some loss of quality – especially on the higher end of the spectrum. On the low end, however, the ZiiSound T6 features a lot of bass. In fact, it can very easily overpower the rest of the spectrum. When being tested in a small home office space, I had my bass knob (which is inconveniently located on the back of the sub-woofer) set almost to nill for a comfortable listening experience. 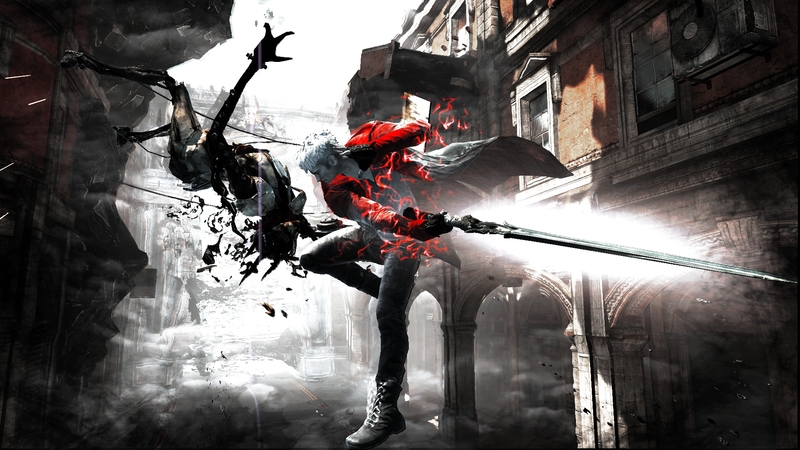 When needing some extra punch when playing id Software’s RAGE, however, I cranked it up a couple notches. Regardless of wired or wireless in terms of interfacing with your PC, you will have these cables attaching the satellite speakers to the sub-woofer. While the audio inputs sending information to the ZiiSound T6 can be wireless, the satellite speakers themselves are all wired, which is kind of a bummer. Creative Labs did pull of something that was light-years beyond brilliant with the speaker system: They included a wireless USB dongle! This means that you can plug the USB dongle into your PC or Mac and stream audio to the system. Or, you can have the speaker system hardwired to one PC and set the dongle up on another, selecting between inputs via the remote control. Additionally, Creative Labs sells an iPod-compatible wireless dongle that will allow you to further increase the number of devices able to stream to the speaker system. 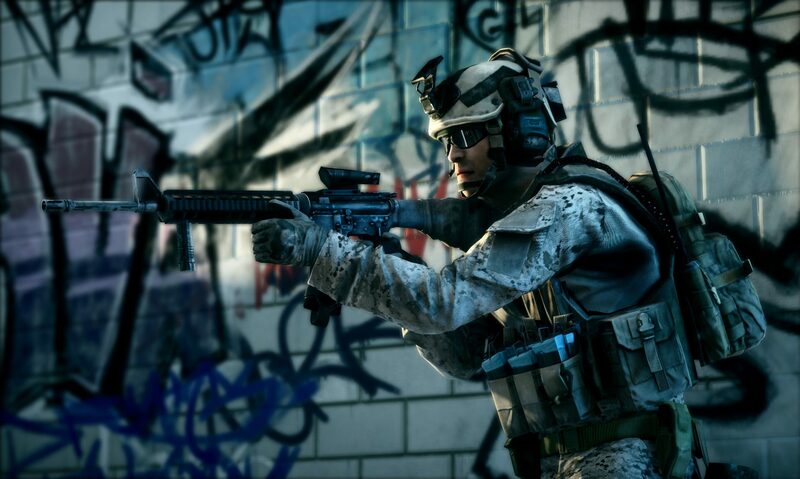 There is a lot of customization for the user here, and we appreciate that. Overall, the Creative Labs ZiiSound T6 wireless speaker system features good audio quality along with a nice amount of customization in terms of how you want to utilize its wireless capabilities. Unfortunately, the ZiiSound T6’s price is a bit higher than we would like to see for the product — especially considering how cheap the remote control feels. At Creative Labs official website, they sell the speaker system for $399.99. If you already have a wireless speaker system that you are happy with, you probably don’t need to purchase one of these. If you are a new buyer in the market for a wireless sound system, however, you could do a lot worse than the ZiiSound T6.